Since 1994, Michael Brown has been conducting research with students in the plasma physics laboratory he established at Swarthmore. His undergraduate research program was recently honored by the American Physical Society. Associate Professor of Physics Michael Brown has been honored with the 2008 American Physical Society’s (APS) Prize for a Faculty Member for Research in an Undergraduate Institution. According to the APS’s selection committee, Brown was chosen “for his outstanding contributions to plasma physics made possible by his development of a world-class spheromak laboratory at the College and for his energetic mentoring of undergraduate students.” The award includes a $10,000 prize from Research Corporation. He is the first plasma physicist to receive the award since its inception in 1986. 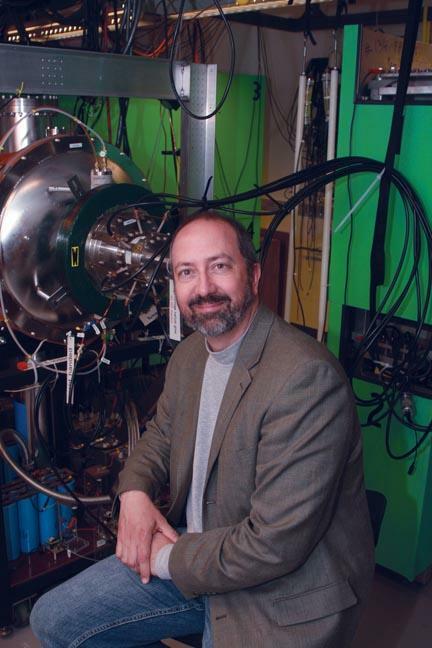 Brown’s work in plasma physics has focused on fundamental astrophysical processes accessible in laboratory experiments (such as magnetic reconnection, plasma turbulence, and ion energization). Beginning the design stage in 1994, he established the Swarthmore Spheromak Experiment (SSX) with the assistance of 16 honors students and $2.5 million in grants from the Department of Energy, the National Science Foundation, and other government organizations. Brown is a member of the National Academy of Sciences Plasma Sciences Committee, a past member of the executive committee of the APS’s Division of Plasma Physics, and a winner of the Department of Energy Junior Investigator Award. Hurray for the Class of 2008!